Been thinking about doing an all-grey MOC for a while now. There are about a dozen non-grey pieces there (mainly 2. axles) but hey, I like the result. 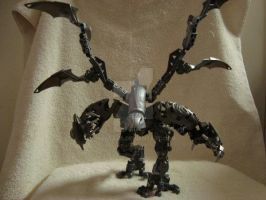 BTW where did you get the grey Rahkshi foot? Yay greyscale mocs. They're hard to do and many people dismiss the colour as old and boring but with the right peices and ideas, cool mocs like this can be pulled off. its like a ww2 soldier! nice. Very nice! But how is the mask held on top? mind if i use the hammer? also, maybe i could inspire a bit. The 'feet' for the hammer can also be used as a face, just look at them with the 'toe' up, and the heel down, facing you for a while, and you'll see the eyes and mouth. I love the moc, great job! Sure, you can use it - just make sure you credit me. And I hate to burst your bubble, but I have a feeling I've seen those feet used as a head before (can't remember where though) - but thanks for the suggestion anyway! hmmmm... I have never seen that before, I thought it was original. oh well. Thanks for letting me use it! Very good design. Legs are a little to thick though. 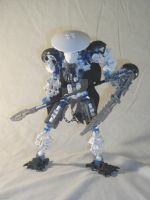 Eh, I figured a miner-like Matoran would be rather bulky everywhere. All grey...heh, this is quite good. ^_^ I like grey, although it only goes with black. Too bad Lego still puts a smatter of it in every set. Peh, its just made of PURE AWESOME!!!! Fab work as usual, dude! I can only see two non-grey pieces.